Working remotely towards a common goal. Developing web applications in a work environment of you choosing. 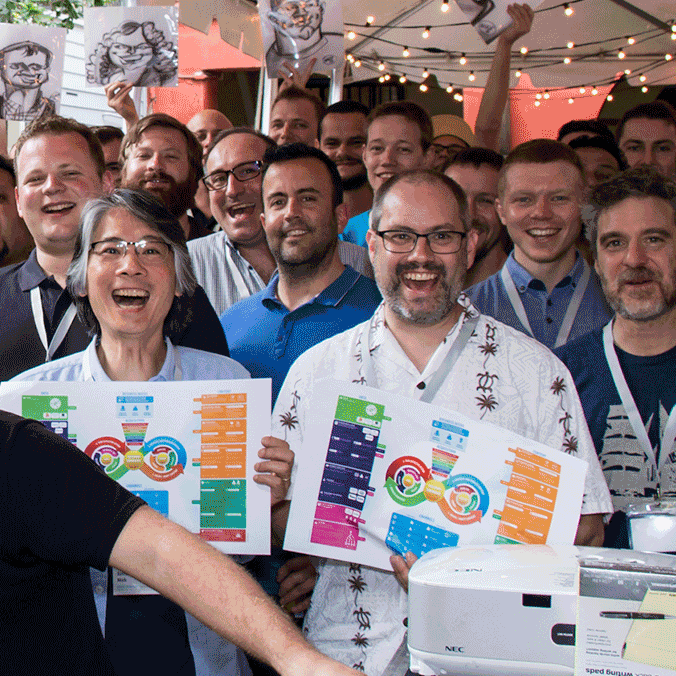 The Cloud Apps Team are a passionate group of geeks, coders, designers and strategists with a startup culture working within a large multinational. We love what we do and get to work with some amazing colleagues. We offer challenging and interesting work. Our aim is to build a long-term, stable and top-quality team and we do that by encouraging a healthy work-life balance and working on some great tech with some great people. As a result of our success, the team has grown rapidly since 2013 and now hails from 11 countries and 10 timezones. We make careers, as well as awesome digital applications. Our team works together using remote technologies like Slack, Google Hangouts, GitHub, Dropbox and many others. Some of us work from home, others share a co-working space, others still work on the road. Working in a familiar environment where you control all aspects of your workplace, your tools and the time of day, simply helps you gets things done. You do not need to commute in frustrating traffic. You can put that time to better use. Recent studies show that productivity increases by a third when people were able to work from home or an environment of their choosing. The studies attribute this to a quieter environment, fewer distractions, and the absence of a commute. For many, one of the biggest perks is, that they have more time to spend with their families. Without a commute, you gain flexibility. This makes time to attend your kids’ events, and spend time with your loved ones, instead of travelling. Commuting and endless physical meetings are boring. There are numerous skills that you can learn instead. With remote working, there are no more excuses. The general estimate is, that you need approximately 20 hours to start to develop a new skill. Working remotely finally enables you to grow in your field or learn completely new skills. While we really are keen on getting things done, we do not force anyone to spend hours in an office. We'd rather have you working during the times, you feel the most inspired and productive. As a freelancer you can take time off whenever you need it without the limitations of a set number of leave days.